With flying private jet charters, you gain the freedom to choose where you go and when. You can pick up and leave with only a moment’s notice. With a Privaira SkyCard, you have access to your own travel space on your terms. By using Privaira’s flight service you don’t have to commit to owning a private jet. With Privaira, you can fly like an owner with our on-demand charter service. Or fly with time purchased through our SkyCard program. When trying to choose between a private jet charter or Privaira’s SkyCard, you have two considerations: availability and cost. With the SkyCard program, there are never any surprises. Your travel plans execute efficiently and smoothly when using the benefits that come with the Privaira SkyCard. Privaira takes pride in guaranteeing an available private jet whenever you want to fly. We want to ensure that unforeseen circumstances, like maintenance issues or crew availability, don’t interrupt your travel plans. Privaira always has a private jet from our extensive fleet available and waiting for you. However, when you book and pay for a specific jet with other private jet companies, they cannot guarantee the availability of your requested jet. If the jet has a crew or mechanical issue prior to departure, you may have a flight interruption or cancellation. When it comes to flying by private jets, the cost is a big consideration when evaluating flight options. 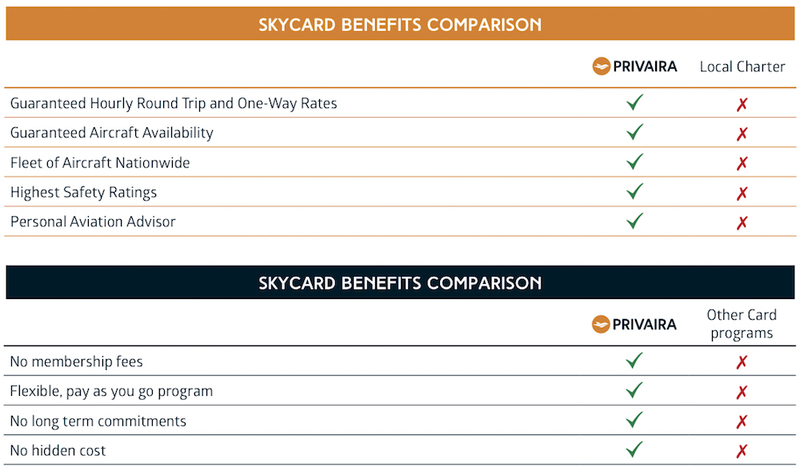 With the Privaira SkyCard, you get guaranteed flight pricing. As a result, you know in advance, how much your travel costs. Knowing the cost in advance makes trip budgeting more consistent and easier to plan. When chartering a private jet, your price quote is on a trip-by-trip basis and depends on availability and market circumstances. Often, other private aircraft charter companies charge you additional and unexpected fees. These extra fees sometimes include a return flight even though you booked a one-way trip. Privaira considers the safety of our customers, crew, and aircraft a top priority. Because of this, we make safety an integral part of the aviation culture and use it in every aspect of Privaira’s operations. We always pride ourselves in meeting and exceeding the demanding external audit requirements including the Federal Aviation Administration (FAA) regulations and guidelines. You will be charged a round trip rate based on occupied flight time only. There are no additional charges for deadheads or repositioning flights, pilot wait time, pilot expenses and overnight fees. Round trip rates apply to fl ights that return to your point of departure with an average of at least 2 hours of fl ight time for each calendar day of the total round trip domestically and 2.5 hours for international flying. You will only be charged for occupied flight time of one-way flights. There are no additional charges for empty legs before or after we have picked you up or dropped you off. One way rates apply to fl ights that do not return to your point of departure, and are at least 2 hours of flight time for each calendar day of the trip domestically and 2.5 hours internationally. We invite you to call us for a free consultation before becoming a member and seeing all the benefits we have to offer. Please call 1.844.778.2472 or email us.